You might like this game if you like logic puzzles. 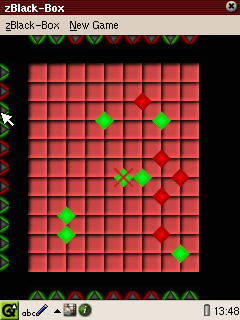 zBlack-Box is an interesting logical puzzle game. Crystals are hidden in a black box and you can shoot laser beams into it. They beams are reflected at the crystals and therefore changing the direction of the beam. By shooting the various beams you have to deduce the position of the crystals which are not visible to you. The crystals in the screenshots are placed by you and are your guesses. The game idea of zBlack-Box is very nice. It could well be part of a movie where you have to hack some kind of equipment. However, it is not easy to deduce the position of the crystals and you need quite some patience to play the game. 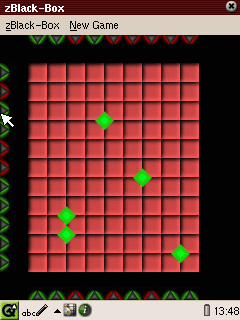 The graphics of the game is relatively plain and there is not much variation, except for different setups of the black box. Basically, I think it very much depends on your personal taste whether you will play this game a lot or drop it immediately. If you like action	games stay clear of this game. If you like to think a long time about a puzzle give the game a try. If you don't know and as the game is free you should give it a try and find out whether you are a puzzle freak or not.